EMCO MSI Package Builder is one of the best tool available in the market place which is capable of converting an .exe file to .msi file easily without any errors in few simple clicks. Installing applications on each and every system at your office or workstation manually is bit time taking task and need hell lots of patience. This might be done complete manually in smaller offices but the real problem starts with the large sized offices with hundreds and thousands of computers. Here comes an urgent need to compete this task automatically, if you’re looking for such tool then EMCO MSI Package Builder is waiting for you. Here is a comprehensive review of EMCO MSI Package builder disclosing everything about it and how it works. 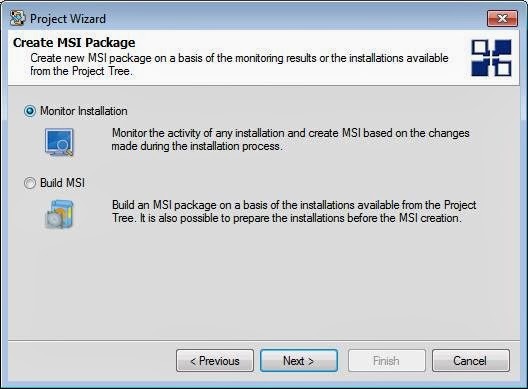 MSI stands for Microsoft Installer. 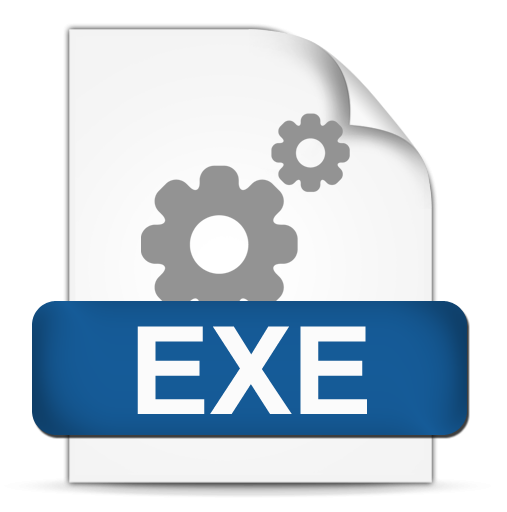 Windows mainly works on the exe and MSI files, so, if you have an installed package on your computer, and the same you want to install on another computer, then it is always advised to make an executable file for the package. Only solution for this the application should be packed as .msi file. If you want to install the applications automatically on client’s computer, then .msi format is only available solution. Most of the companies still release their tools in old .exe formats. EMCO MSI Package Builder helps you to package them into .msi format. Making an executable file for the package makes sure that you do not lose any data in the process of reinstalling the package. As well as, if you use MSI package builder like EMCO MSI Package Builder, then you get many other options to customize the package. You can add or remove the elements of your choice, you can change the name of specific elements and the whole package. Let’s walk through a quick review of one such software which lets your customize the package while making the MSI file. It is making use of live monitoring technology to record any registry changes and file system changes. Using EMCO MSI Package Builder you can create an .msi file in two possible ways. One is by manually creating and configuring the package by making use of visual editor and the next possible way is live monitoring technology which can automatically develop the package file. Best part of this tool is, you can even decompile the existing .msi file to make any required changes. Once the changes are made to the file, you can recompile the same with changes as a brand new .msi file for further installations. The process of deploying is pretty simple, thanks to the simple UI of EMCO MSI package builder. Silent deployment is one of the major feature of this program which makes sure that while deploying the package, you can choose the option of silent deployment and once you are trying to install the package, you can do the same without any option. Provided, you need to be logged into Windows with the administrator rights. EMCO MSI Package is currently available at market place as two editions: Professional edition and Enterprise edition. Professional edition comes with live monitoring technology. If you are in need for automated process, then go with this Professional edition. Enterprise edition has more options when compared with Professional edition. It is capable of creating or deleting the users and modifying the system start services and lots more. Depending on your needs and usage you can you pick one among them. Let me take you through a proper MSI packaging process. 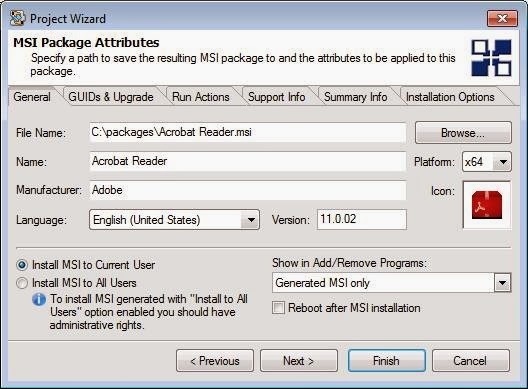 Here I’m taking about an adobe product which is in .exe format and packing it into an .msi file. This process is very simple and can be done in minutes. Before activating an evaluation copy of EMCO MSI Package Builder, make sure you have already installed .NET Framework 3.5 or higher on our machine running on Windows operating system. If you’re a Windows 8 user, you’re lucky; .NET framework is installed by default on Windows 8. Open the EMCO MSI package builder. Once you open that, it will ask you to select the project which you want to deploy. The process is known as repackaging installation wizard. There are two type of process by which you can deploy the package. One is knows as wrapping and the second one is monitoring. Monitoring process lets you deploy the package with more ease. After the option to deploy the package is chosen, it will ask you to locate the folder where the installation files are located. These files are the ones using which you need to create a new MSI file. Once the path is chosen, it will ask for the installation options. This will be needed only if you have some special instructions to be followed when the MSI file is used for the installation. If you want the process to be with default settings, leave that option. There will be a few more options related to the setting of the MSI package which you are trying to generate. Simply walk through the option wizard. 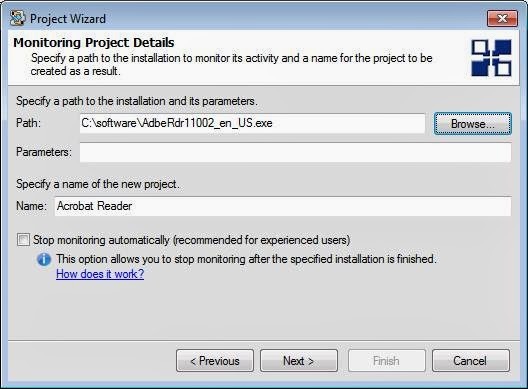 Once the wizard is completed, there will be one process to deploy the package finally with the settings you chose in the course of the process. That finished the process of deploying the package. However, you will need to wait till it finishes with the instructions and the final package is presented to you in Windows explorer. The time taken for the final process might depend on the data size and the instructions given. Once the package is generated, make sure to test it by installing a virtual OS and testing the package onto it before you start distributing the same. I have tried many tools in market place to convert an .exe file to .msi file but most of them created many errors and trust me EMCO MSI Package Builder made my work completely without any error and troubles. I have tried the packaged files on virtual OS and it silently installed successfully and worked like a charm. I highly recommend this tool for your company and each and every penny you spent on this tool is completely worth and makes complete sense.